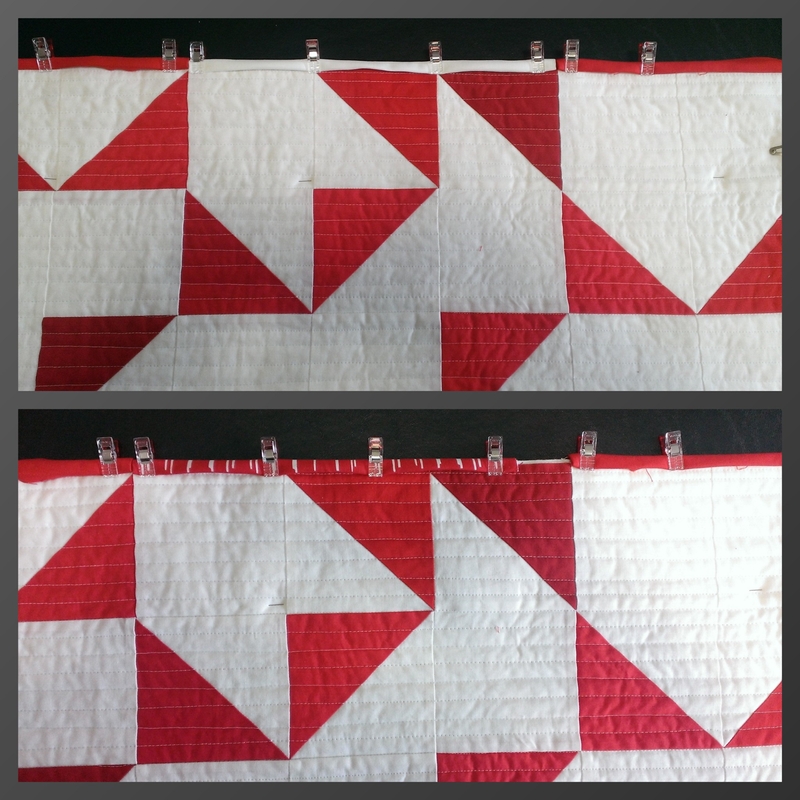 When the Seattle Modern Quilt Guild issued the Binary Two Color Quilt Challenge in August 2013, I knew I would make a red and white quilt. Or a blue and white quilt. These classic two color combinations have a timeless graphic quality which I have always loved. 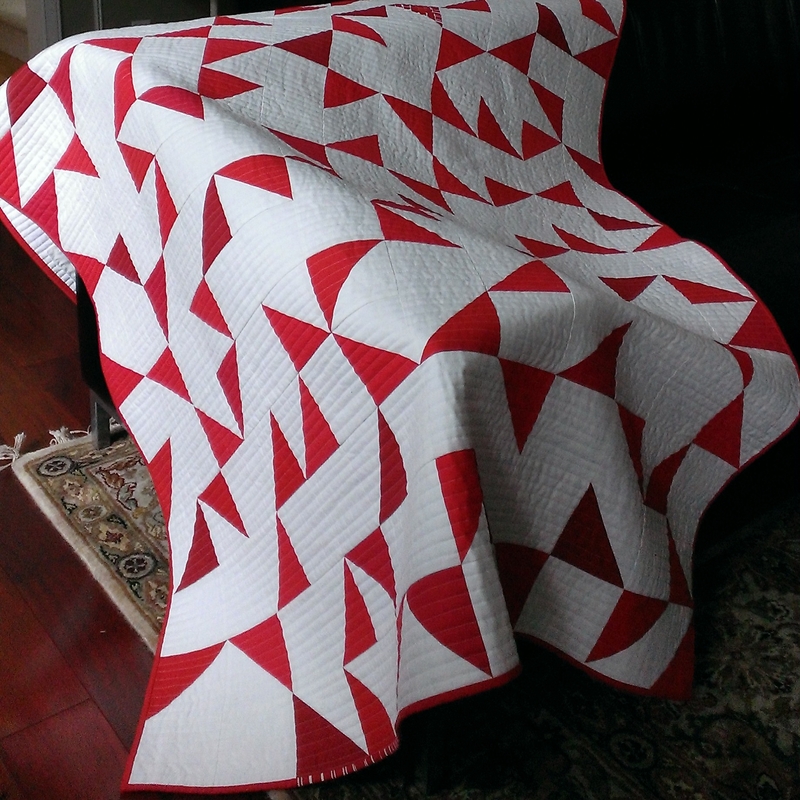 Red is my favorite color and I already made a blue and white quilt. So, it wasn’t a hard decision after all. Red it was. Color settled, I moved on to design. 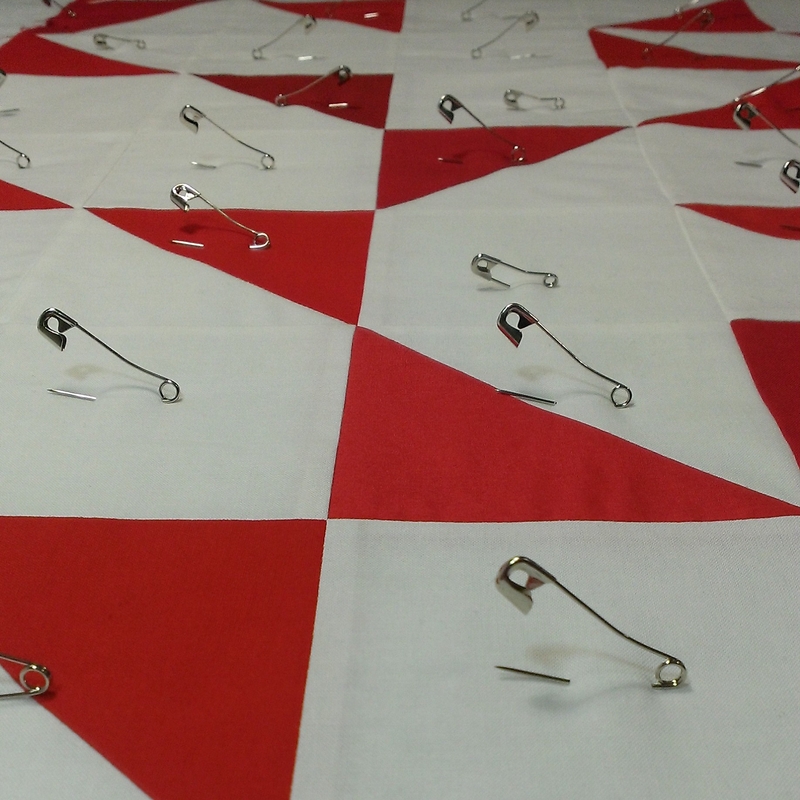 It had to be graphic and relatively quick to complete since the quilt was due in December 2013. Inspiration comes unexpectedly and from the oddest sources. While weeding through emails, I happened across an ad for a coffee mug featuring graphics by Anni Albers. D’uh! Wonderfully graphic with unexpected rhythm, Anni Albers’ work is a treat. A flight to New York gave me plenty of time to sketch and explore options on paper. 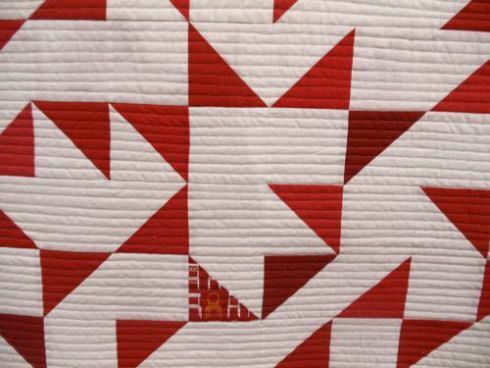 I chose half square triangles over flying geese due to the time frame. 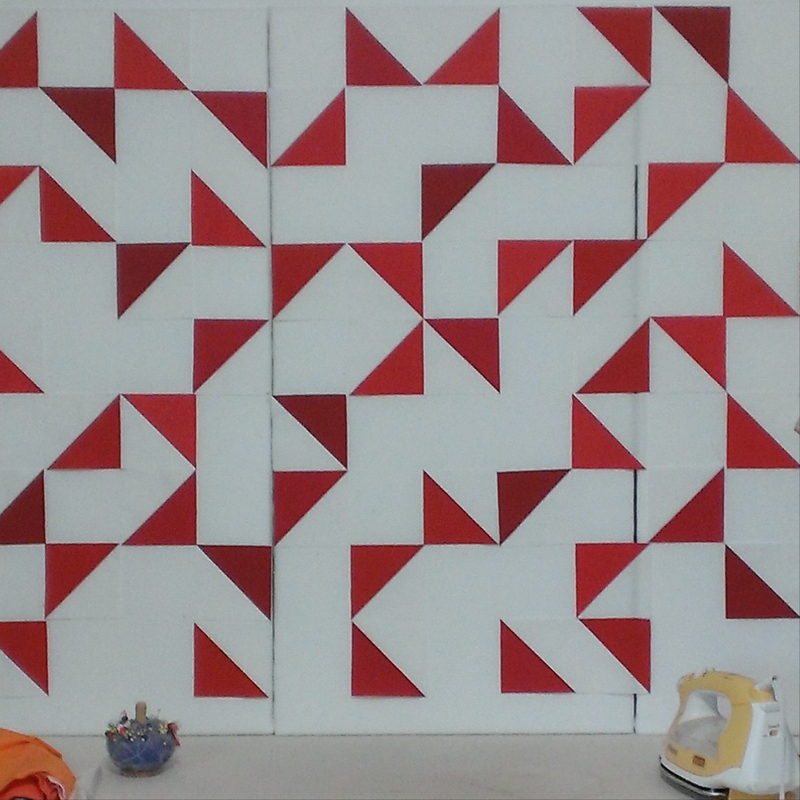 Then I selected five different red solids in a very tight value range and started on the blocks. The design wall was crucial in working out the final arrangement. I had a fat quarter in my stash that was crying out to be included in this quilt. Just a bit of unexpected was needed and so I added it. Every red and white quilt needs a maverick orange chair, right? 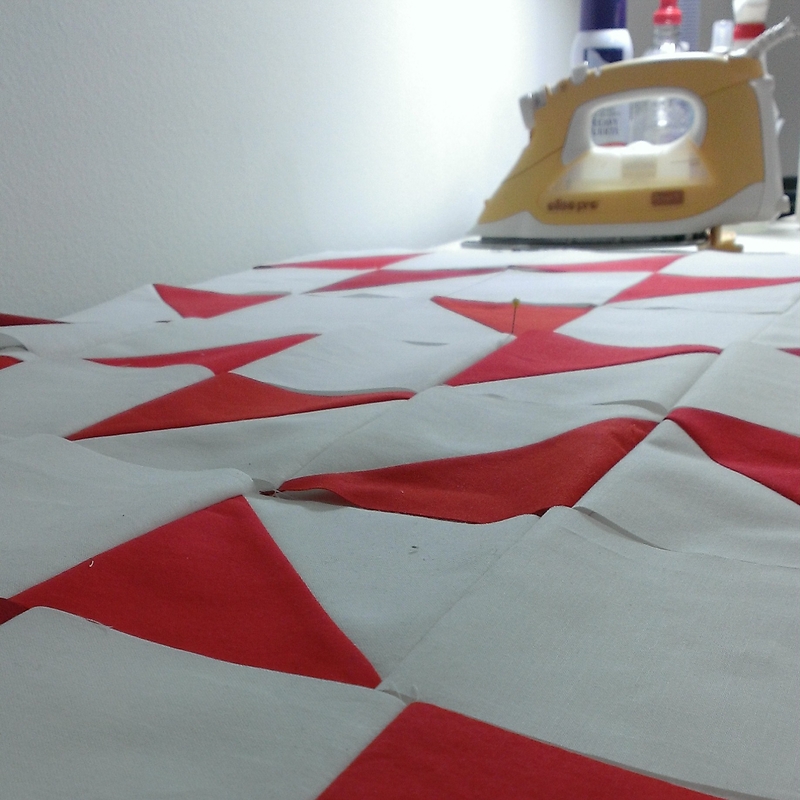 There was much piecing, pressing, and trimming of half-square triangles. Then there were many bobbins of thread. And many hours of quilting. As in enough time to watch My Fair Lady and seven and half Harry Potter movies. I tried a few binding options and one of the solids always seemed right. Then I added a bit of the darkest red as an accent. Total fail. It was too muddy and looked like a mistake. What to do? Ask your Instagram buds to chime in on other options. 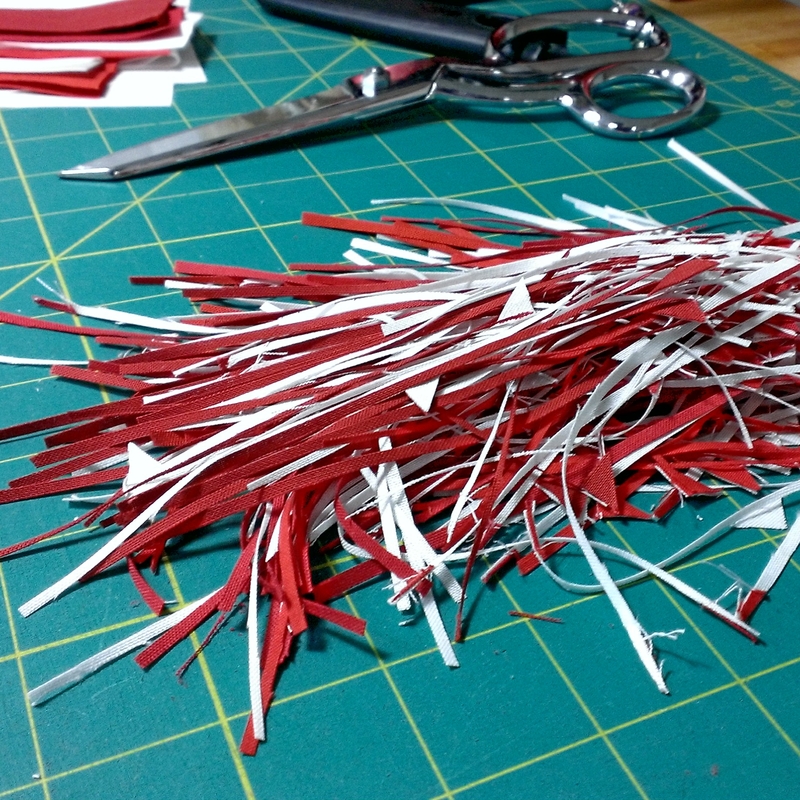 Surprisingly to me, the print option was the unanimous choice over the white (good thing they didn’t see the dark red). I couldn’t be more pleased. The print reads as red but adds just the right sparkle to the binding. The fabric is the chair print used for the orange chair block but cut and folded so only the chair legs are visible. As a bonus, I think the stripes have a bit of a digital pattern. 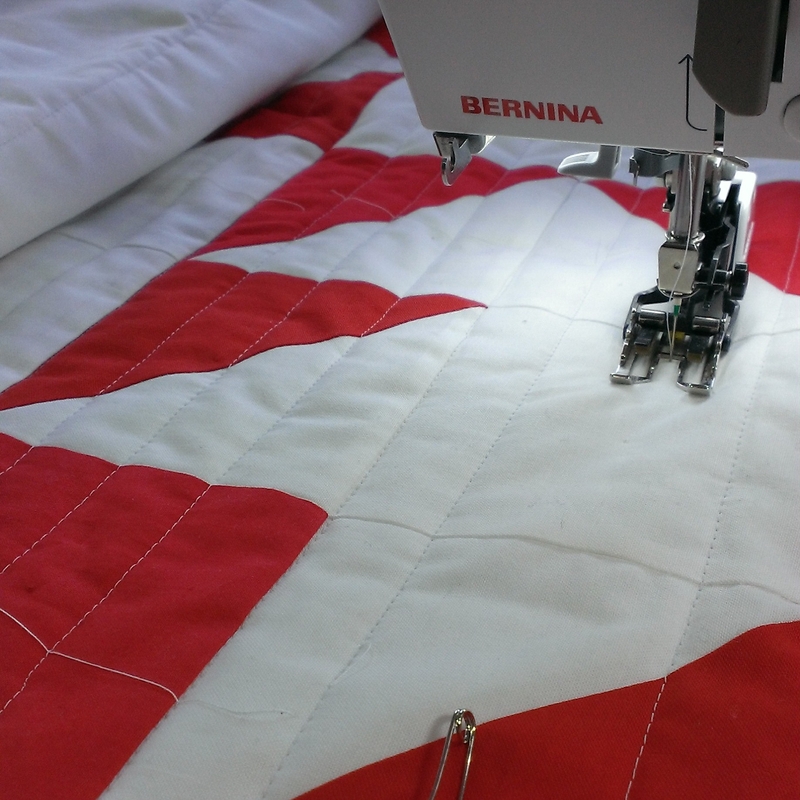 Hand sewing the binding is one of my favorite parts of quilting. 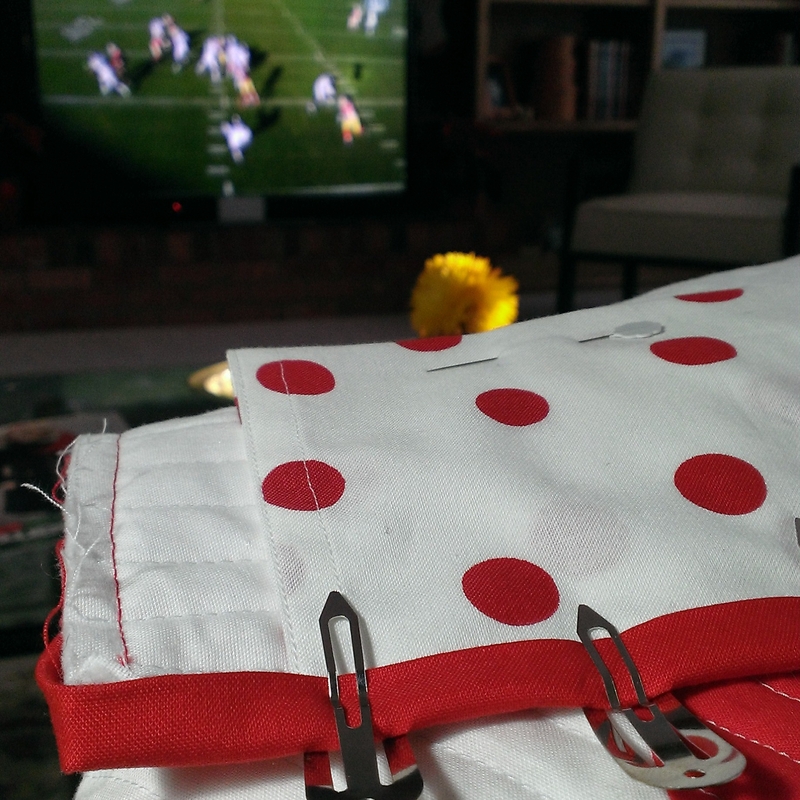 It’s just so satisfactory to sit and sew with a quilt in your lap. Especially while watching football on a Sunday afternoon. And finally the quilt was bound, labeled, sleeved and ready to go. And in time to be delivered for the Seattle Modern Quilt Guild Binary Two Color Challenge Exhibit at Island Quilter on Vashon Island. 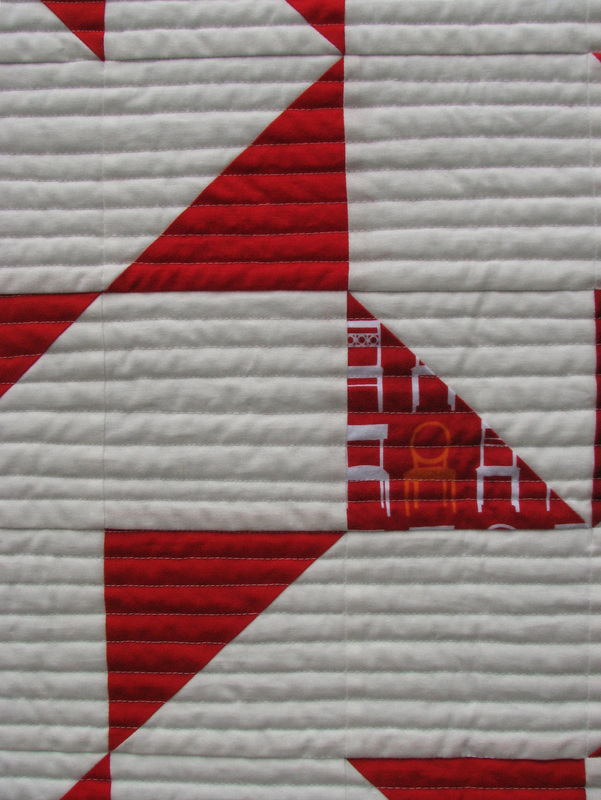 Take aways from this quilt – be flexible and focused, make visual decisions visually, rework when something’s not working and deadlines can be good things.